When I think Lawrence Public Library, I think video games. Some people won’t like that, but I can’t help it. At LPL we have a killer game collection. And it just got killer-er with the addition of Nintendo Switch games! Nintendo’s little system that could is off to a great start. In just over a year, the handheld/home console hybrid has moved more systems than its predecessor the (underrated) Wii U. But the sales wouldn’t have come without some great software to back it up, so bring on the games! 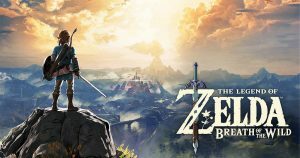 Nintendo celebrated The Legend of Zelda’s 31st birthday by releasing one of the series’ most ambitious (and critically acclaimed) games yet. Breath of the Wild (Wii U, Switch) takes place a century after a catastrophic event wreaked havoc on the kingdom of Hyrule. I immediately fell for the beautiful Studio Ghibli-esque world, but even more praiseworthy than the art direction is the amount of freedom BotW gives its player. After an expertly crafted introduction, you’re free to climb, run, ride, and glide anywhere you see. People have sprinted through the game in less than an hour, while others have taken their time and played for hundreds. The game’s not perfect; I miss classic Zelda dungeons and tools (no hookshot?! ), but for me that small complaint pales in comparison to the game’s living, breathing, and incredibly fun world that’s stuffed to the gills with puzzles, challenges, and lovable weirdos. If you love fantasy, but want something a little less joyous (ya grump), put a hold on Dark Souls Remasteredopens a new window, out this May. The series is known for its punishing difficulty, but the Souls games are more than exercises in masochism; their intricately designed, nightmarish, gothic fantasy landscapes are populated by wildly inventive monsters that can now ruthlessly kill you on the go. Prefer something with a little more futuristic bent? Dust off the old Nintendo Wii (or Wii U) and step into Samus Aran’s space boots. It’s been over 30 years since the original Metroid blew the gaming community’s collective mind by revealing that the blocky orange robot that just saved the universe was a LADY (très progressive for a video game in ‘86). The Metroid Prime Trilogy (Wii/Wii U) is a collection of atmospheric, first person, exploration-focused shooters and a great warm up for when Metroid Prime 4 finally comes out on Switch (not soon enough). If you need a Sci-Fi shooter for your Switch right now, things don’t get much more intense than DOOM. It’s a reboot of the classic demons on Mars—you read that right—first person shooter. Its frenetic, propulsive gameplay rewards you for attacking aggressively. If you’re squeamish, this may not be the game for you; it is V-I-O-L-E-N-T.
And there are just so many other great games. Mario Kart 8 Deluxe—probably the best kart racer since Double Dash (yeah, I said it!). Arms—Nintendo’s newest and screwiest IP has you boxing with elastic, you guessed it, arms. Splatoon 2—which definitely should’ve been named Spla2n—remains one of the most creative and unique shooters I’ve had the pleasure of playing. Instead of racking up kills, your goal is to spray ink wherever you can. At the end of the match, a cat named Judd tallies everything up and whichever team has inked more turf wins. If you prefer an IP that’s a little longer in the tooth, Kirby Star Allies takes the traditional power suckin’ pink puffball and pairs him with three partners. Whether those are controlled by AI or your friends is up to you! Well, and your friends too. 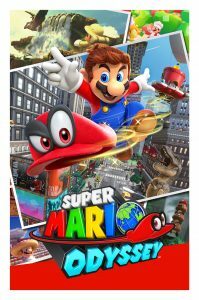 And last but certainly not least, I’d be crazy not to mention Super Mario Odyssey, one of the best Mario games to be released yet. Taking pages from Super Mario 64 and Super Mario Sunshine, you’re dropped into wacky digital playgrounds brimming with things to do. Seduce a lady goomba. Do some 8-bit platforming in a poncho and sombrero. Escape a rampaging T. Rex...on a scooter. And much much much more. In addition to classic Mario running and jumping, Odyssey introduces Cappy, a ghostly hat that allows you to possess dozens of Odyssey’s inhabitants, which opens up brand new styles of play that never disappoint. Except for maybe the pine tree. The pine tree just moves very slowly. You still want more games? We’ve got them, but you’ll have to check them out yourself. What are you waiting for? The Legend of Zelda image via Nintendo.